We no longer recommend Lucky Flop because of their very low traffic. If you would like to play bitcoin poker on your iPhone, Windows Phone or Android device, we would recommend the US friendly Nitrogen Sports. 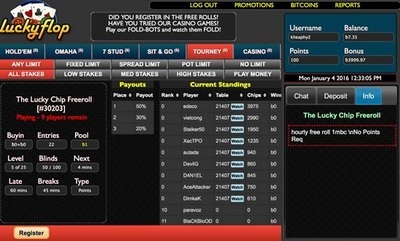 Lucky Flop is a bitcoin poker room that accepts players from the United States. Play bitcoin poker on any iOS or Android. Lucky Flop supports Sit N Go, Scheduled Tournaments and Free Roll Poker Tourneys. Play Texas Hold'em and Omaha real-money poker in the US. As Bitcoin continues to grow more popular with now more than 3 million users worldwide, it was only a matter of time before online poker rooms decided to open their doors to the masses of people owning the cryptocurrency. Lucky Flop supports real money Windows Phone poker and real money blackberry poker games. 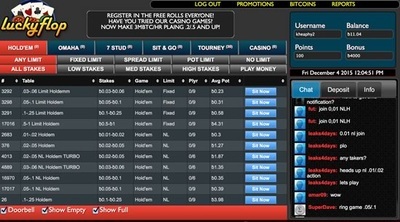 ​Surprisingly, there are a number of advantages to playing at these tables rather than regular currency ones: you don’t need to verify your account information with ID which is usually a lengthy process, there are no transaction fees as you don’t have to convert one currency to another, and, best of all, rake charges are lower than at normal tables so you can win more money! Given all of these benefits to playing poker with Bitcoin, you’d be losing value if you don’t make the switch – and there is no better place to do it than at Lucky Flop, one of the largest Bitcoin poker rooms around. Take a look at the details below to find out why the Lucky Flop app is used by so many. 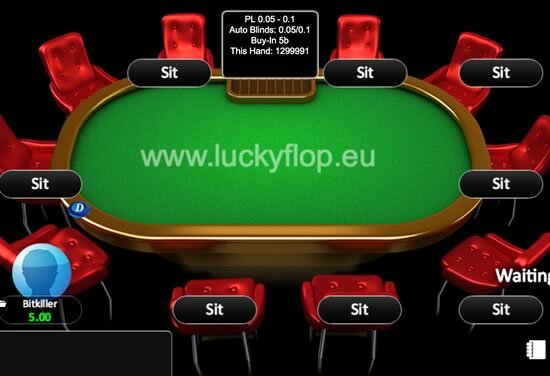 Though you might expect a new Bitcoin poker site to offer fewer tables than its longstanding regular currency competitors, Lucky Flop proves that it can hang with the best of them. With enough stakes provided to cater for the first-time player, the high-rolling professional and everything in between (beginning at 0.01/0.02 BTC and scaling up to 2/5 BTC), you can find a table suited to you with the Lucky Flop app. There are even play money games running so you can develop your skill without worrying about burning through your Bitcoin. Whether it is a cash game, sit & go or large tournament you are after, the Lucky Flop tables have you covered. There are 6-max and full ring games to choose from for cash players, heads-up and 5-max tables for sit & go enthusiasts, and massive tournaments boasting big fields and big prizes. 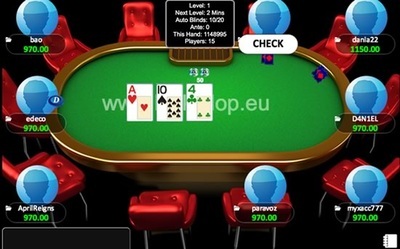 ​On top of all of these options, there are some other great poker variants to be enjoyed – these include Omaha, a crazy relative of Hold ‘Em where you play with four hole cards rather than two, making it a more dynamic game. With a selection of tables that equals even the most popular online card rooms, the Lucky Flop app is one of the leaders in the Bitcoin poker market. It can be frustrating when a poker app offers so much to its user but is fundamentally unenjoyable to use. Thankfully, those who developed the Lucky Flop app clearly understand how important the poker experience is to the user. The client is optimized for all mobile and tablet devices, ensuring a full, high-resolution display which is easy on the eye. ​There are a variety of detailed, 3D background themes which give you the impression that you are sat right at the table: play in a grand ballroom to get that casino atmosphere, or alternatively relax in the loft to get that comfortable feeling of a home game going. You can speak to others at your table through the in-game chat feature, furthering the realness of the Lucky Flop poker app. For those of you out there who switch off after folding your cards, multi-tabling is supported so you can keep the cards in the air by playing multiple tables at once. If this sounds challenging, don’t fret – there are alarms to alert you when you need to act, and even a written notice of the strength of your holding to prevent any accidental misreading of the hand! ​Mobile and tablet users should note that the Lucky Flop app is browser-based rather than being downloadable through your app store. This has two benefits: it is accessible to all users (including those on a computer) rather than an exclusive group, and you don’t have to spend any time downloading, installing or updating the app. Simply go straight to Lucky Flop and get playing! First-time depositors will collect a 2000mBTC reward, while free money is up for grabs for all players with dozens of freerolls running each day. Despite Bitcoin poker being a relatively new phenomenon, the Lucky Flop app has the quality and feel of the most well-established online poker rooms. Its vast selection of tables will keep even poker veterans interested, while the freerolls and micro-stakes on offer mean that you don’t need to make a huge deposit to start growing your bankroll. Given the many advantages of playing at Bitcoin poker sites – lower rake charges and no transaction fees are only a few – you’d be making a bad play by not checking out Lucky Flop today.